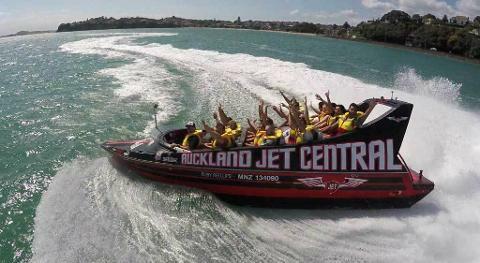 Auckland Jet Boat Tours is proud to be 100% New Zealand owned and operated and we are committed to providing all our customers with a thrilling and unforgettable jet boating experience. We are dedicated to the very highest levels of safety and customer service and we want every moment you spend with us to be fun and safe. We aim to make sure that you have a truly unforgettable experience, laugh a lot and come away with some great memories. Located at: Top of the tidal steps, Karanga plaza (Wynyard Quarter) You will find us in a red shipping container by the white draw bridge. Our currently operating Jet Boats, affectionately known, as ‘Ruby Red Lips’ and Livi Lightning They are powered by a bio-fuel, Volvo, Twin 420hp 6.0L Generation IV GM V8’s via two 213 Hamilton Jet Units. Ruby has an operating capacity of 23 passengers and Livi can take up to 17 people. They are capable of speeds up to 85 – 90 kph so she packs a serious wallop!